Two keynotes were presented in English, two in Japanese. Yet nothing was lost in translation. Well, maybe a joke or two fell a bit flat. But for the most part, simultaneous translations bridged the language gap at Discovery Summit Japan. As SAS Principal Research Fellow Bradley Jones talks about definitive screening designs, one screen shows English content and the other shows the Japanese translation. The Nov. 7 event was the first time the conference series left the country. 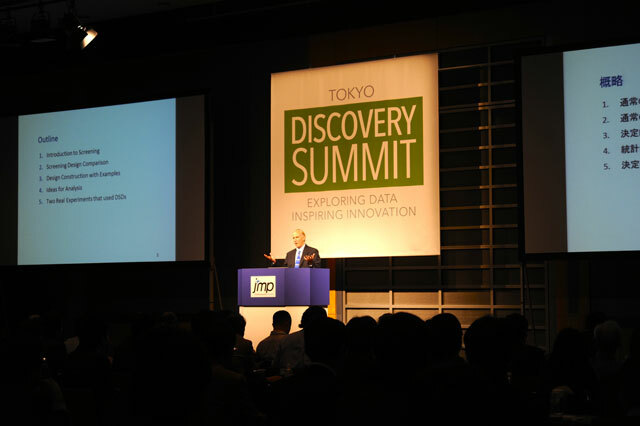 Discovery Summit Japan mirrored the US conference in several ways, principally by conveying the universal themes of excellence in data exploration, innovative uses of analytics and the need for analytics to be more widely accessible across organizations. “Statistics are going to make us so strong,” said Tadashi Mitsui of Toshiba Corporation. As long as you use JMP, you are getting the best from statistics, he went on to say during his keynote address. Mitsui and Takaya Kojima from Waseda University both gave keynote speeches. Also featured were talks from John Sall, SAS Executive Vice President and Co-Founder, and SAS Principal Research Fellow Bradley Jones. More than 150 JMP users attended, including Yoko Suzuki of Tokyo Metropolitan University. Suzuki said she had wanted to attend Discovery Summit in the United States but hadn’t been able to make the trip. As soon as she saw that JMP was hosting one in Japan, she knew she would attend. The conference series will continue to move into regions with high concentrations of JMP users, with Discovery Summit Europe next. That Summit will be held in March in Brussels, and is being led by a Steering Committee made up of JMP users from across the continent. Perhaps we will see you there? If not, plan to attend Discovery Summit 2015, which will be held next September in San Diego. 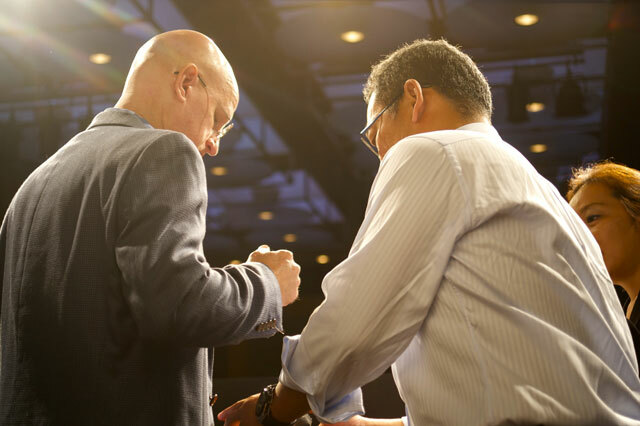 JMP Customer Care Manager Jeff Perkinson gets a microphone in preparation for hosting Discovery Summit Japan. 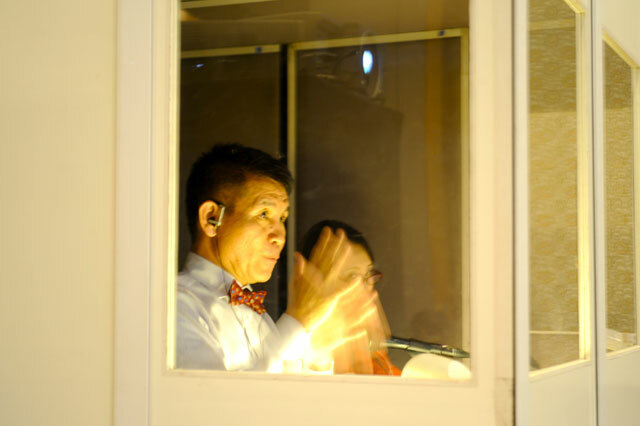 Translators work from a soundproof booth, providing both Japanese-to-English and English-to-Japanese simultaneous translations. 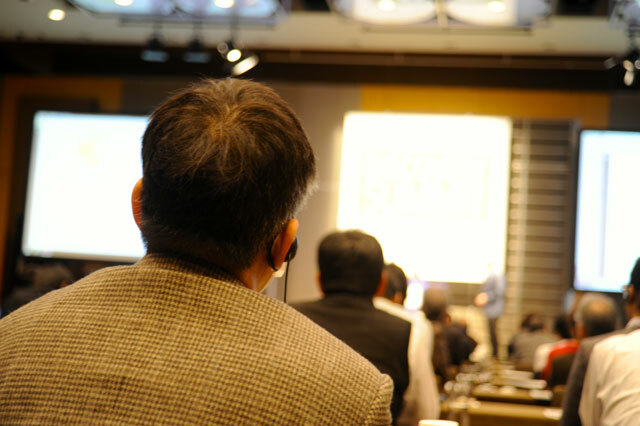 Japanese-speaking attendees wear ear pieces to hear English translated into Japanese. JMP Japan Systems Engineers help staff the “Ask the Experts” stations. This is comparable to the “Meet the Developers” sessions at Discovery Summit in the US.